December 16, 2016 - January 6, 2017, featuring works by: Ann Blankenship, Elizabeth Buckley, Mary Rawcliffe Colton, Cindy Dworzak, Linda Giesen, Naomi Julian, Dan Klinglesmith, Vivian Skadron, Jaye Whorton, and Nancy Wohlenberg. 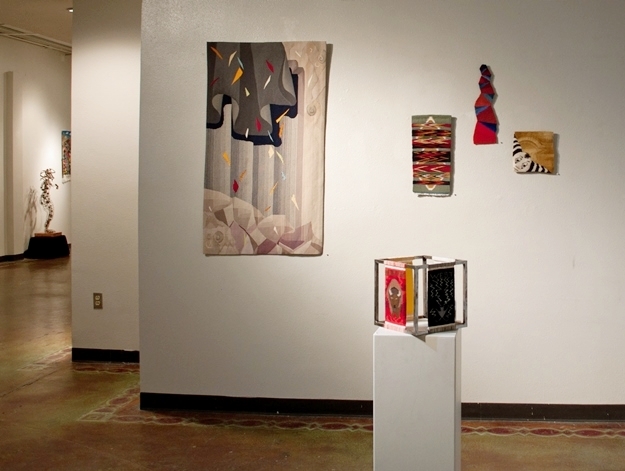 The idea for this show began with an invitation to the Tapestry Artists of Las Aranas Spinners and Weavers Guild from University of New Mexico College of Fine Arts' Dean, Kymberly Pinder. 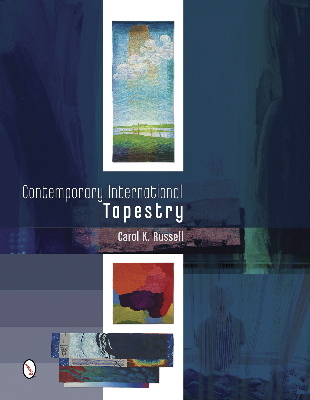 Mary Rawcliffe Colton spearheaded the idea of pushing the limits of our comfort zones in tapestry, whether it be with conceptual or experimental work or with design and technical challenges. The venue space, located at the end of a six-story parking garage, was also a challenge with its main 70 foot long rectangular room of 11 foot walls, with a small entrance area on the north end and a small 14 foot alcove at the south end. 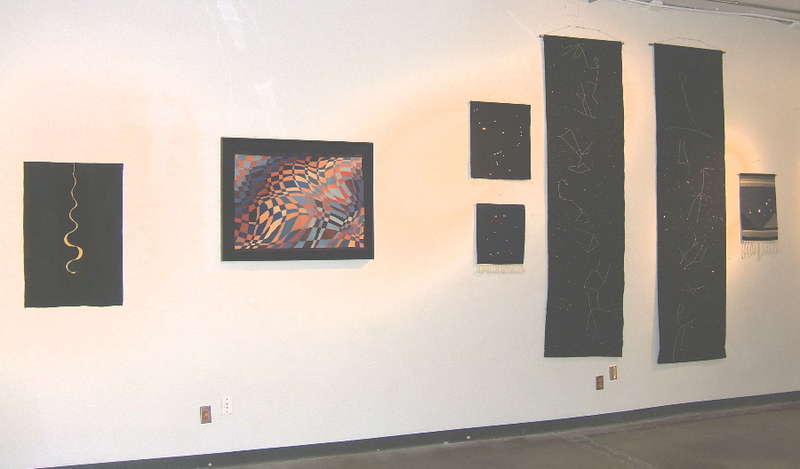 Juried and curated by Mary Colton and Nancy Wohlenberg, with input from gallery director, Lara Goldmann, Questioning Limits ultimately became an opportunity for each of the ten exhibiting tapestry artists not only to create new tapestries, but also to show multiple pieces from their body of work. Mary Rawcliffe Colton's Roadsides Bloom Plastic uses strips of plastic bags on ramie warp, Ghiordes knots. 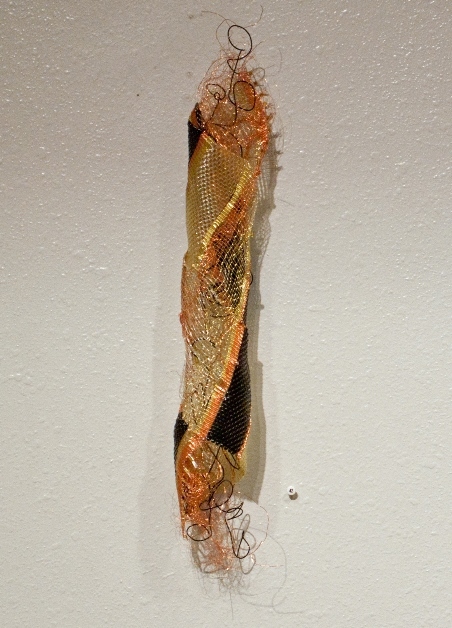 Ann Blankenship's Sundance with Alisha incorporates wire, prayer ties, and wool. 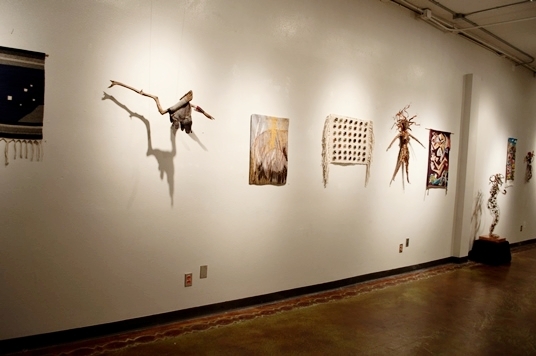 Ann Blankenship's Invasive Species incorporates wire, wood and wool. 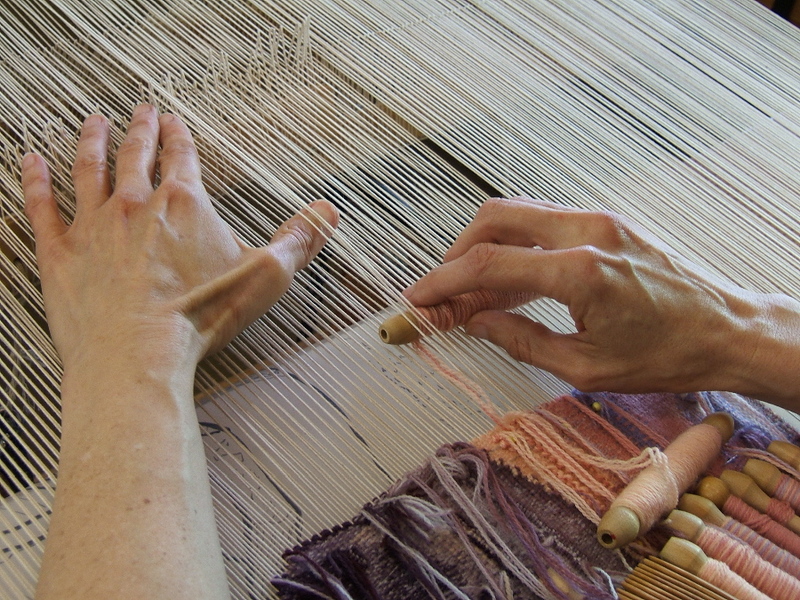 Elizabeth Buckley wove Crane off-loom, utilizing tapestry, macramé, and warp-faced finger weaving so that she could be free to manipulate, fold, knot, or weave the threads and woven areas. "Some of the threads served as warp for awhile, then weft. There was no tension on the warp, although I did tape it down to keep it orderly. I improvised a lot, breaking many rules!" Mary Rawcliffe Colton's Bumps in the Road incorporates pulled warp with use of smaller and smaller wefts to reduce the weaving width from 5 to 1.5 inches. In Ann Blankenship's Four Directions, the metal cube is the loom. 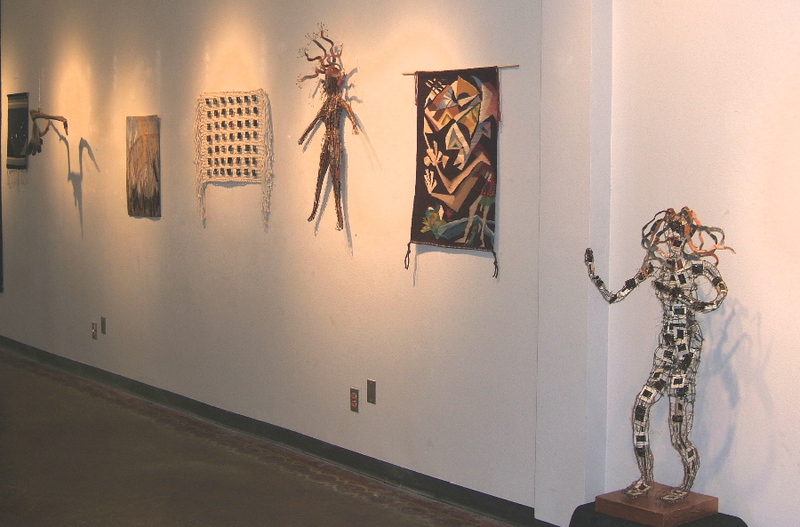 If you cannot make it to the opening or closing receptions, the gallery is open on Wednesdays and Fridays 10:00 am - 6:00 pm. Special thanks to Nancy Wohlenberg for use of her photos, as well as for her photo-editing skills on my images. Photo credits: Elizabeth Buckley, unless otherwise noted.